Top 5 most expensive rugs in the world! 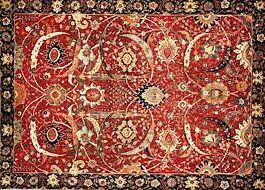 We would be lying if we say that we haven’t once thought that “Rugs, especially oriental rugs are so expensive”. It is definitely safe to say that we have now accepted that rugs are an expensive investment. But, how much would you pay for a rug? A thousand or most a couple of thousands right? Well-crafted rugs can add a tremendous amount of beauty and can elevate the decor of anyone’s home. Would you consider paying millions of dollars for a rug to spice up your living room? These people sure did! 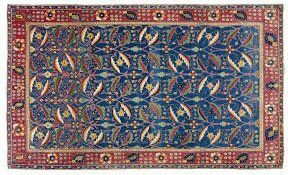 According to The Guardian, as quoted by Alrug, this 16th century finely crafted Persian rug from North West Persia was “looted by the Nazis from the Austrian branch of the Rothschild family during the Second World War”. This tremendous rug measures over 20-feet in length. It was initially estimated to be worth $400,000 but was bought by Sheikh al-Thani of Qatar for $2.4 million. 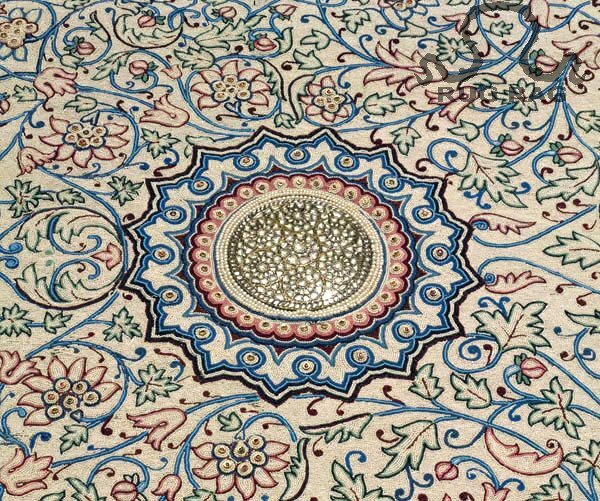 The Pearl Carpet of Baroda is an extraordinary work of art and it is considered to be the true testament of wealth, sophistication and grandeur. This Indian masterpiece consists of half a million “Basra” Pearls and it is embellished with emeralds, sapphires, rubies and diamonds. Sotheby’s held an auction in 2005 and it was sold for $5.5 million dollars in the state of Qatar. The Kirman “Vase” Carpet is an ancient mid-17th-century Persian rug consisting of rich and bold colours. 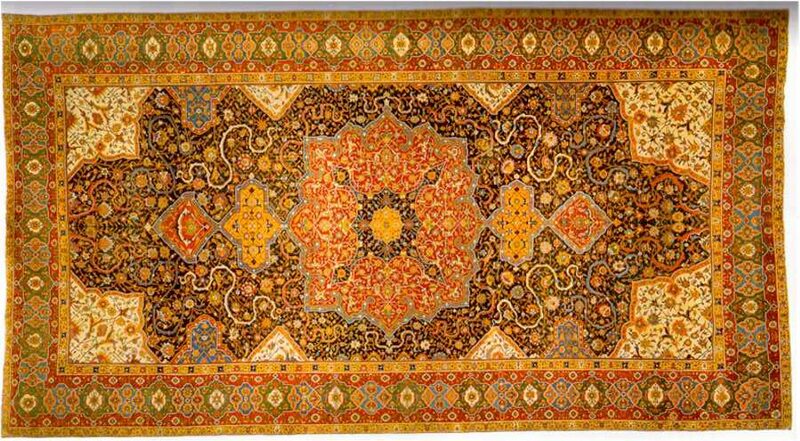 It belonged to Kirman of the Safavid period, the carpet is said to be full of charm, simplicity and balance. It was sold to an anonymous telephone bidder at Christie’s in London for £6.2 million. The 17th-century Persian rug was a part of the William A. Clarke collection. It is most appreciated for its rich brown colour and the intricate design. In 2013, it was sold the Corcoran Gallery of Art in Washington, D.C. through Sotheby’s to an anonymous bidder in June 2013. The Clark Sickle-Leaf carpet costs a ground-breaking $34 million making it the most expensive rug sold in the world. The Bayeux tapestry from the year 1070 is a total of nearly 70 metres long and about 50 centimetres wide. The tapestry highlights the most important moments in the Britain History- the Norman conquest of 1066. Time has taken a toll on this magnificent piece of art, leaving it at 69 metres when originally it was longer than 70 metres. The tapestry is termed “invaluable” due to the significance and size. It cost Britain 45 million euros just borrow the tapestry. So you can imagine how much it is worth? These rugs are magnificent pieces of art and cost millions of dollars. Although, our home rugs do not cost us millions, they definitely cost us thousands and are a big investment. Thus, it’s best to maintain and care for them through regular professional rug cleaning services which assures that you keep your carpet clean as well as protect its warranty. Call us on 1300 946 946 for more information or book our services for residential or commercial services. We provide services in areas throughout Brisbane , Redlands, Ipswich, Gold Coast, Sunshine Coast and even Melbourne and Sydney.